Bathroom remodeling projects are one of the most common types of home improvement projects among residents of Louisville, KY, and the surrounding areas. 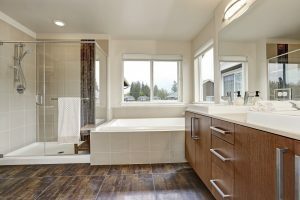 Many homeowners are looking for a cost-effective bathroom remodel option that will provide the comfort, safety, and beauty they desire. At Compozit Home Systems, that’s exactly what we offer. Our easy and convenient bath remodeling services can give your bathroom the facelift it needs so you can enjoy the space you deserve. Whether you’d like to convert a tub into a shower or would simply like to upgrade your existing bathing space, our Nu-Bath Liner Systems are an ideal choice. Made from thick and durable acrylic that is fitted over your existing tub or shower space, Nu-Bath Liner Systems can be installed in as little as a single day and are far more cost-effective than a full tear-out and bathroom remodel. Plus, because your new acrylic surface is 100 percent non-porous, you won’t have to worry about heavy scrubbing to keep your tub or shower looking like new. Compozit Home Systems is proud to offer walk-in tub options from Hydro Dimensions. For individuals who are planning to age in place, have limited mobility, or would like to increase the safety of their bathing space, walk-in tubs are the perfect solution. Our safe and accessible tubs feature multi-functional showerheads, low-entry thresholds, built-in seating, and ergonomic grab bars and door latches. For enhanced comfort, these tubs also feature hydrotherapy air jets as well as aromatherapy and chromatherapy options that can make you feel like you’re in a spa. To learn more about how we can upgrade your bathing space in as little as a single day, contact Compozit Home Systems today. We proudly offer bathroom remodel solutions to homeowners in Louisville and throughout central Kentucky.